Tennis has been a part of my life for as long as I can remember. My junior year in high school I decided that I wanted to do something more with tennis than just play. Growing up with a cousin with asperger syndrome, I knew how hard the condition can be on a family, but did not know much about autism in general. 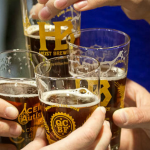 Curious about autism and looking for a way to help, I began to research the condition and found a non-profit organization called ACEing Autism, which felt like a great fit. 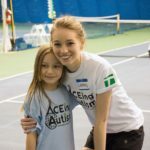 Being a tennis player, I was drawn to join ACEing Autism because it hosted tennis programs taught by high school and college students for autistic children. However, I was disappointed to find that these programs were located in California and Massachusetts, with one soon opening in Nashville, all nowhere near my home. So I contacted the founder of ACEing Autism, Richard Spurling, with ideas to start my own branch in New York. I had no idea how difficult it would be to achieve this goal. Just finding court space took two months. Once I decided to run the program at The Masters School, I had to get insurance coverage and had to choose dates for the event. I decided to run the program for two hours every Sunday for six weeks in the spring. Once I figured out the rest of the details, such as obtaining the equipment, I faced the biggest challenge yet: finding the children to participate. I contacted many different organizations and people and received very limited responses. I finally arranged to have an email sent out to over three hundred families who were involved with the organization South East Consortium, which aids children with disabilities and special needs. I was also able to place a message on the Autism Speaks website, which is the most famous and influential organization supporting autism in the world. I began to get phone calls from parents, asking questions about signing up their children. Many of the parents were shocked to find that I, a high school student, was running the event. The final challenge, which reoccurred each week, was getting students to participate as instructors. But after hours of planning, I had equipment, tennis courts, instructors from my school, and students ready for the first session. I did not know what to expect. Would children show up? Would I have enough instructors? Just as I began to doubt my success, a family approached the courts, followed by others. Before I knew it, ten autistic children were on the courts playing tennis for the first time. Although I knew that these children had difficulty with communication, only after the first session did I realize how extremely disabling autism could be. One child could barely speak, let alone express full thoughts. He approached me with a glazed look across his face and chanted, “Moo. Moo.” I handed him a racket and began the lesson. I was shocked to find that this boy, who had never played tennis and could hardly form words, rarely missed a shot. I had always assumed that talking comes naturally and that playing tennis is substantially more learned. I was wrong. The next session, this boy came back repeating the word “tennis”. Each child is a different mystery and has a range of abilities that, in some cases, surpass those of an average child. When the parents of the children expressed their gratitude, I was thrilled. It was hard for me to comprehend how much patience, motivation, and love these parents have for their struggling children, and it was gratifying to know that I had made their strenuous jobs slightly easier that day. By the end of the program, the instructors, fellow students at my high school, all felt that the experience was priceless and beyond rewarding, and learned so much during the six weeks not only about teaching tennis, but also about communicating with children. The most moving part of my experience was watching the children develop over the six weeks. As they improved in tennis, I learned how to motivate them to overcome the barrier of autism. It was fulfilling to be able to execute my ideas in a way that brought members of my school community together while giving these children an opportunity they would not have otherwise had. Little did I imagine how enriching it would be. This experience clearly displays that determination, organization, and perseverance pay off.